MSV: The Raia-Mason ticket decides? ATTACK!! The Raia-Mason ticket decides? ATTACK!! Flyer indicts Ruben Ramos for "allegiance to the criminals of Hoboken past!" We're a week out from the election and who are Old Guard friends today are over the side tomorrow. 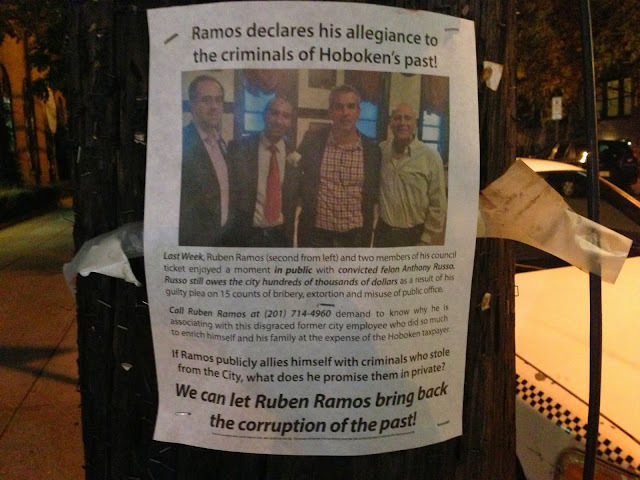 So with that, here's a flyer attacking Ruben Ramos for his Russo clan alliance. Someone got ahold of this recent photo and put it on a flyer. It's up on a Hudson Street pole barely a block away from Chez Mason Civic. Beth Mason who has been a checkbook for the Russo's going back to 2009 and every election since is most definitely a suspect. Grafix Avenger has a story on the same flyer making an appearance. Say it isn't so Beth. Say it isn't so. Anthony Russo appears on upper Hudson Street. The last line wasn't proofed and should read "can't."